This month we’re sharing posts about the Mastery Collaborative community's explorations at intersections of culturally responsive education and mastery- based teaching and learning. This year, 141 teachers and administrators from MC member schools attended anti-racism trainings facilitated by Border Crossers, an organization that educates educators about race and racism. We ask educators at our trainings to problematize traditional education in these three realms: grading practices, facilitation, and curriculum—and to bring their knowledge of race, racism, and cultural responsiveness to bear on reaching for more equitable practices. Here are ideas from our community about how to make curriculum more responsive to and empowering for students. Have suggestions or questions? Drop us a line: team@masterycollaborative.org. Three take-aways and best practices from the Living Lab visit at MS 442: “Operationalizing your mastery philosophy"
MS 442 came to mastery-based grading four years ago, when they were thinking about how their school could better serve students. Math teacher Lisa Genduso says, “we were always strong with supporting students socially and emotionally, always good at making students comfortable and confident...but the rigor wasn’t so high.” In a search to up their rigor, the school partnered with design thinkers to support them in thinking through their school’s goals. “They did a really good job of questioning us and listening to us,” Genduso reports. From this reflection on their school’s philosophy, the staff decided to pursue competency-based grading. The coherence of MS 442’s philosophy is striking, and suggests that other schools may benefit from the reflective and generative practices of the MS 442 staff. Read more about MS 442’s “Intentional School Design” here. Because continuous improvement is part of the school’s philosophy, students have built-in class time to revisit learning outcomes for practice and re-assessment. At MS 442 this time is school wide, and known as “update week.” During this time students are given a chance to improve their mastery level in a given outcome. “We’re giving them the language to think about which skills they need to work on,” Priyanka, a math teacher, explains. A successful update results in one demonstration of mastery. At MS 442, students need three demonstrations across time. MS 442 uses an in-house grading tracker called “The Hive,” designed by self-taught tech-guru and math teacher, Jared Sutton. Because The Hive is custom built, it tracks not only learning outcomes, but the school’s mentoring system, and behavior tracker, as well. At MS 442, behavior is disaggregated from grades and tracked separately. “We document behavior in a way that connects to their positive behavior incentives. They’re eligible for incentives as long as there’s no unresolved behavior issue. They always have the opportunity to restore,” explains Jared. This restoration opportunity further messages the idea of growth--students at MS 442 always have chances to practice and improve. Interested in hearing more from MS 442 student Moheeb? Check out this article from the New York Times. MISSING WORK IN A MASTERY SYSTEM: WHAT TO DO? Progress report season just passed, and it brought up a lot of lingering questions about our grading policy. One we can’t seem to agree on is, how do we enter missing work in the gradebook? Entering a “1” doesn’t seem like it reflects what students know. But also, some kids aren’t doing homework. That should show up in the gradebook, right? Any advice? Progress reports are where the rubber meets the road, and “report card day” provides a great incentive to look at how your grading policies play out practically. Kudos to you for doing the work of digging in and examining your policy! Your instinct to enter a “1” could be spot on—maybe, maybe, depending on your school’s pedagogical approach... After all, in a mastery system that “1” should represent “Not Yet,” as in: The student has “not yet” provided sufficient evidence of mastery. Even better would be a grading system where you can enter the words “Not Yet” instead of the “1” that may feel punitive to you. Separately, there’s a homework-related issue to discuss here. In a mastery system (or any equitable grading system), grades should be a message about where students are on the path to mastery of skills and knowledge. So, grades should not be used to reward completion of a task and/or to reward compliance (showed up on time, was not disruptive, etc.). A grade for turning in homework is a completion/compliance grade. Maybe your school needs a grading policy that specifies what kinds of tasks get entered into the grade book--these should be rich assessments of student learning. Homework, do-now’s, and other smaller/faster checks for understanding may not be grade-worthy evidence of student learning—but they’re invaluable information for you about how much students are getting traction with the instructional goals in your class—and they are a great basis for timely coaching and feedback to help students get the traction they need. In addition, tracking these sorts of smaller tasks may give you a picture over time of who’s making steady progress and who needs support—so while we suggest not grading these more grain-sized checks for understanding, we do suggest, tracking them in a way that doesn’t impact students’ grades, but give you a record of what’s going on on a more daily basis in your classes. Instead of entering a “1” or a “NY” for tasks that are skill practice, like homework, classwork, or formative assessment, try tracking these tasks without grading them. Let us know how it goes. Thanks for writing, and happy progress-monitoring! Though we talk about mastery all the time, we get ah-ha moments frequently in our shoptalk with mastery practitioners. Here are three ah-ha moments we'd like to share with you. "Ahhhh, I get it now!" How Can We make THE SWITCH AWAY FROM 1-100 GRADES? Since our teachers are now giving letter grades instead of number grades in classes, the question came up about whether we are going to use letter grades on report cards as well. We haven't done this in the past. I know that lots of our old numerical grades weren't really indicative of student learning; I don't think just using letter grades on its own is either, but I'm not sure what implications I'm not thinking about if we make that switch now. 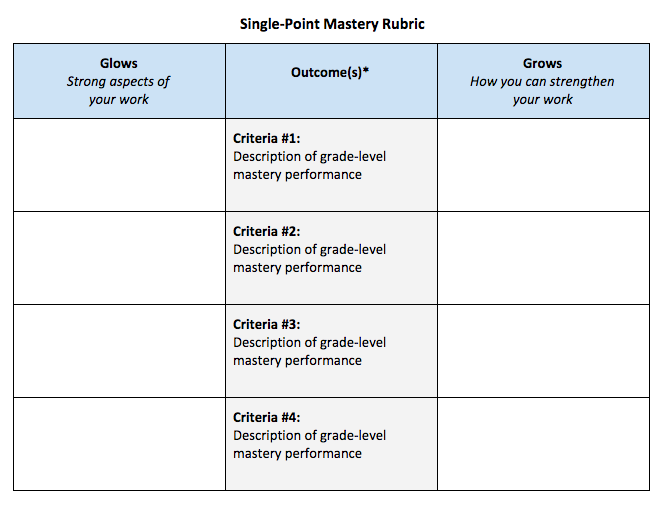 Switching to letter grades from 1-100 scale is a possible first step along the path to a more mastery-focused approach to grading . . . we have another grade-conscious school making this very shift this year, as a first step toward a genuine mastery grading practice. Using letter grades is a first step in a continuum—and it might be a good place to be for this school year. Another matter: Schools are supposed to have a grading policy that is written and produced on demand by students/families who want to know the basis for their grades. So any change, from what the grades are for, to what marks are being used, should be indicated in a grading policy that students and families can see and know about. Here is DOE guidance on grading policies, updated for this school year. Also linked is their guidance specifically for schools using mastery-based grading practices. When the mastery lightbulb turns on, it is tempting to shift a bunch of practices all at once, but incremental change can be a sensible way to move forward. The most important thing is to message each shift in practice/policy clearly to teachers, students, parents, and other stakeholders—be clear about exactly what is changing, and why. Being sensitive to where stakeholders are is a great practice--kudos to you for knowing what next step is appropriate for your school! How we found our ‘why’—and how we’ve used it to create urgency and common purpose in our community’s quest for greater educational equity. Any school that has embarked on shifting to mastery-based teaching and learning can tell you that messaging and mission are vital to this complex endeavor—which affects every aspect of teaching, learning, assessment, and school culture. A clear and powerful mission inspires all stakeholders to connect to and invest in the work more deeply and authentically. Without a clear mission, the work of a school or any organization is susceptible to a lack of focus, resistance from within, and confusion in implementation. As a leader, it’s hard to call the shots without a guiding mission. As a member of a community, it is necessary to have clarity about what’s happening and why. A strong mission statement articulates the ‘why’ that powers the work. Great missions connect the day-to-day operations of an organization with a desired larger impact, and ideally, all stakeholders can contribute to its creation. Once a strong mission is developed, it should then become fundamental to the way you speak about your work. When taking on large and complex endeavors—like transitioning away from traditional education to mastery-based models—the ‘why’ must be meaningful and inspiring enough to justify the sustained focus required to accomplish multidimensional school change over several years’ time. In working with our school partners, we help to co-create communications materials and provide training that supports school leaders and staff in talking to parents, students, community partners and others about their school's mastery-based systems. We also model the kind of mission-driven communications that practitioners can use to think about their own communications approach. In these schools, students regularly described what they were learning and why and were able to pinpoint how they could improve; we were seeing the self-confidence and assurance of students who valued school and felt they belong there, who were were empowered to own their learning—and we were seeing educators who believe in the young people they work with, and who understand that power is not a zero-sum game. Helping students find their power as learners only makes a class more compelling and powerful for them. Giving up a position as a lecturer at the front of the room only means finding more power as a facilitator of students’ learning. By the conclusion of MC year one, a hypothesis was forming: that there was a unique connection between mastery-based shifts, culturally responsive practices, and equity. To share out these ideas, we made program videos such as Why make the shift to mastery-based learning? and How does mastery transform school for students and teachers? We began our second year knowing we had to explore the connection between mastery, cultural responsiveness, and equity. The MC community of schools eagerly joined in, digging deeper into the why of mastery learning, and the philosophy that both demands and powers these complex shifts. This definition of educational equity has been meaningful to our team as we explore how mastery and CRE together can create more equitable learning for young people. In year 2, we asked each MC member school to create a goal for infusing CRE into their mastery-based practices. Additionally, we asked everyone in our community of educators to attend an anti-bias training called “Talking about race and mastery.” We set up a series of dates for small sessions of this training, hoping everyone could find a time to come together to explore the intersections of race and schooling. We also facilitated a working group that met online and in person across the year to explore the intersection of mastery and CRE. This group developed the Equity Snapshot, which beings to detail the ways that CRE and mastery intersect. By popular demand, we also started the yearly MC Summer Institute this past July with a Day 1 deep dive on CRE and mastery. Here are the resources from that day. Our school-based community members contributed reactions, opinions, and ideas around our mastery-and-equity hypothesis. At trainings, gatherings, and site visits, we invited and made time for conversations and written input about the relationships between mastery, cultural responsiveness, and equity. We made a practice of synthesizing, incorporating, and sharing practitioners’ ideas about philosophy and practices. Transparency: path to success is clear and learning outcomes are relevant to students' lives and interests. Shared criteria reduce opportunity for implicit bias. Changing power dynamics: facilitation shifts refocus the roles of students and teachers to include flexible pacing, inquiry-based, collaborative approach to learning. Student drive their own learning, and teachers coach them. of mastery-based and culturally responsive practices to create more equitable environments in New York City schools. Armed with this clear and powerful new mission, our communication strategy came into clearer focus. Now it is easier to build coalitions with others who value this work. Our mission has created a sense of urgency and a through-line for all we do. This video highlights the voices of students, teachers, administrators, and experts from the field in hopes of connecting these dots for a wider audience. Students and teachers reflecting on past experiences in traditional settings and provides context for shifting to a more culturally responsive approach to mastery-based teaching and learning. The video lays out our organization’s vision through quotes from Chris Sturgis of CompetencyWorks and members of the Mastery Collaborative team. Constructing a short video to translate the urgency of the work was difficult work, and was possible only after our yearlong process of inviting co-creation of our mission stance across our community. We hope that the short video can assist in crystallizing our focus and mission for all stakeholders, and can be used to galvanize the urgency this work for the MC community and beyond. The shift to mastery-based education is complex. It requires shared commitment to “unlearn” old ideas, approaches, and systems—and to embark on a long-term, coordinated effort with a multitude of stakeholders. A mission that is clear and aspirational provides common context, clear direction, and justification for sustained effort across a school community and across several years of change management. A mission is a filter for everything your organization or school does or might do, and a rudder to keep the course set in the best direction. So how do you create a mission that will win hearts and minds, and stand the test of time? Co-create your mission statement with valued stakeholders, inviting the input and expertise of everyone in the group, when engaging in any complex philosophical change. Hear out their reservations and concerns, as well as their enthusiasm and willingness. Create a mission your whole community can buy into, but that can also be tailored to different audiences. Each member of your school community has a different role in pushing the work forward, and a strong shared mission will keep those efforts cohesive. Incorporate a range of voices and perspectives from across your organization as you communicate your mission to new or larger audiences. This helps to communicate the buyin your mission has, as well as how it matters to and affects various stakeholders. Across the MC community, there is a great urgency to our work—so the way that we talk about our mission is of utmost importance. Across our community, we seek to create to conditions for students to understand and own their trajectory as learners, and to experience the motivation and joy in learning for the thrill of learning itself. We want our students to feel that their identities are seen, understood, and valued within their schools. We need to be transparent with students in regards to what they need to improve on to achieve success in any given classroom. We need to build system capacity and write policies to support this work. We need to keep seeking new allies and partners in this work, to better serve those young people who stand to benefit most, to the extent that we get it right. Your organization may share some of these urgencies, or may have other important work to accomplish. How you message your mission will partly determine your degree of success. New York City Department of Education created the Mastery Collaborative to support schools that were ready to take on the new frontier of mastery-based learning. The Department’s policy for school autonomy has formed a strong foundation; however, schools need support as well. Led by an extraordinary group – Jeremy Kraushar, Joy Nolan, and Julianna C. Brown – the Mastery Collaborative is building a network of leader-educators, a knowledge hub, and a shared vision of what mastery-based learning can be in NYC. “Speed round” conversations at a Mastery Collaborative meeting allow school leaders, teachers, and students from participating schools to “cross-pollinate” effective ideas, practices, and experiences about mastery. In the above photo, Justin, a 7th grader from Brooklyn, talks to Joaquin Vega, principal of Bronx International High School, about how students feel the impact of mastery-based grading. The Collaborative is made up of forty schools: eight Living Lab schools and thirty-two Active Member schools (a list is at the bottom of this post with links to the articles written about the schools CompetencyWorks has visited). The Living Lab schools provide visitors with a chance to see what mastery-based schools look like and to talk to other educators who are experienced at working in a schoolwide mastery system. Living Lab schools also post resources in a shared wiki page so others can quickly look at different options regarding grading practices, design of competencies, or school policies. The Mastery Collaborative team works with the schools to set goals aligned to a shared community framework, learn from one another, and develop overall guidance documents. For example, they have developed a tool to evaluate LMS systems to expedite the process for schools to consider different products. They are in the process of working with DOE Central’s Office of Academic Policy to offer PD that will help schools develop fair, transparent, and comprehensive mastery-based grading policies and messaging for teachers, students, and parents. The Mastery Collaborative community has developed a shared language for talking about competency education in NYC with the Framework for Mastery Implementation – school-wide systems, curriculum & classroom planning, facilitation, and communication. The framework will be useful to schools trying to understand the school-wide systems and classroom practices, so it is included in detail below. The Collaborative uses a range of techniques to help schools hear about each other’s practices. At a professional development session, they hold “publishing parties” in which schools open their laptops and share some of their tools and resources in the community’s digital Sandbox, walking around with a microphone asking, “And what is KAPPA International adding to the Sandbox today?” They have three minute “speed rounds” where people quickly explain a practice they have been using or some strategy that is working with each other…and then move on to the next. “If it isn’t explicit, then it is inherently inequitable,” explained Kraushar. “When we allow the education system to be opaque, then we are tolerating subjectivity. Given the power of racial bias, this has the power to generate inequitable outcomes for students.” Brown expanded, “We need to think intentionally about what we are doing to help students develop their identities as learners. If we aren’t challenging our biases, we are at risk of labeling students, thus shaping their experience in school and their motivation.” Making the connection back to grading, Brown emphasized, “We have to be aware of the impact of ranking students. Some students benefit from ranking, but what is the impact on the remaining ninety percent? There are many ways to recognize academic excellence without ranking students.” This kicked off a conversation about other ways we might recognize students: for their effort, for growth, for deeper learning, for learning from their mistakes. We could have bands rather than individual ranking. We could even rethink how we determine the culturally powerful role of valedictorian. The Mastery Collaborative is increasing their focus on equity over the coming year. They’ve started with a small working group to explore culturally responsive education (CRE) and equity – and in the coming year, each Mastery Collaborative school will set and implement a goal to increase CRE/equity in some way. The focus is primarily on combining competency-based education and culturally responsive education as a means of increasing racial equity, reflecting the district’s emphasis to improve achievement for young men of color and the ongoing racial gap in graduation rates. For more on the Mastery Collaborative, stay tuned for the discussion with John Duval, Executive Director, Model Redesign Team at the NYC Department of Education.